Recently I attended the opening of the eye-poppingly gorgeous and infinitely fascinating exhibition Counter-Couture: Handmade Fashion in an American Counterculture at MAD Museum of Arts and Design on Columbus Circle in New York, on view through August 20, 2017. 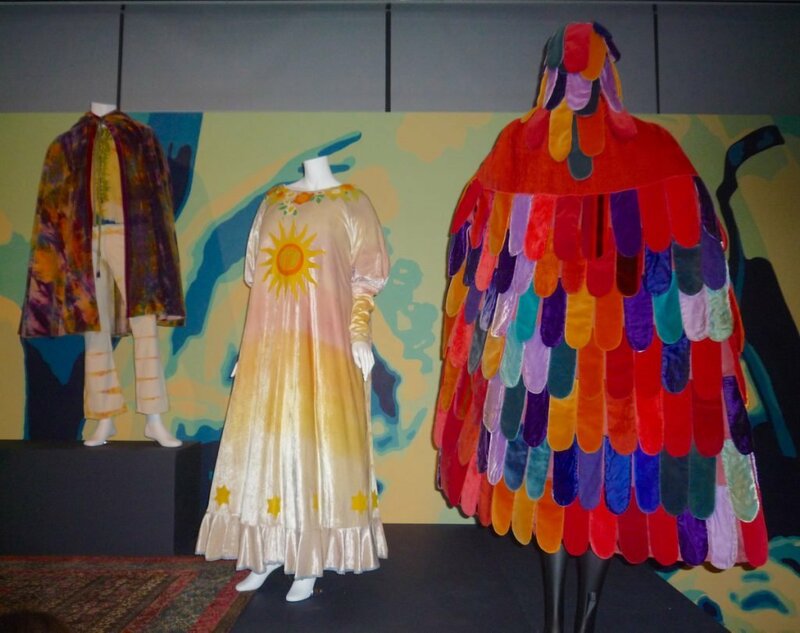 The show impressively highlights the unique handcrafted clothing of the 1960s and 1970s counterculture movements, and its artists’ distinctive extension of politics into culture and style. Rainbow Ensemble, 1969, by Birgitta Bjerke. A hippie globetrotter from Sweden by way of England, France and Ibizia, Bjerke arrived in the U.S.in the early ’70s. Her crocheted pieces could be seen on the Paris runways as well as on the backs of The Who and the Grateful Dead. Going Back to Sweden outfit by Birgitta Bjerke, 1970. Doily Outfit by Scrumbly Koldewyn, 1972. Dancepiece by Leslie Correll, 1971, of hammered brass, Turkish beads, African (Venetian) trade beads mounted on old Indonesia batik fabric, and Bedouin Robe Ensemble with Furs, 1971, by Alex and Lee. Red and Gold Ensemble by Cuca, 1974. Evening Ensemble in gauze and plastic by San Francisco designer Kaisik Wong, 1974. His client list included Tina Turner, Elton John, Dodie Rosekrans and Ann Getty. Salvador Dali celebrated Wong’s style by commissioning the “Ray” series (1974). Tibetan Dream Dress, 1976, and Moth Dress/Kathy’s Dress, both by K. Lee Manuel. Yellow and Green Ray Dress and Headdress from the Seven Rays series, 1974, commissioned by Salvador Dali, by Kaisik Wong. Cosmic Gypsy Ensemble, 1970, by Fayette Hauser of The Cockettes. If you don’t know who The Cockettes were (there was a wonderful documentary made about them awhile ago, I attended the premiere with Bruce Benderson, who hung out with The Cockettes in San Francisco in the ’70s) you can read this article and also this article by the great Rex Reed, which appears in one of my favorite books of all time People Are Crazy Here. Mary Prankster Acid Test Dress and Boots, 1965, by Paula “Gretchen Fetchen” Douglas. On the right is a denim and mixed-materials jumpsuit by Jahanara Romney from 1969. Center: The show’s curator, Michael Cepress. “The exhibition shares the vital stream of passion, ideas and the artist activists who chose fashion to help create a better world for us all,” said Cepress. “As the show now begins to travel, it is an honor to showcase it at MAD and bring the magic of it all to a New York audience. From left: Yes, that’s Fayette Hauser of The Cockettes, who has work in the show (the grass-skirted Gypsy Ensemble behind her) with Mara Hennessey and her husband, the one and only David Johansen, of one of the greatest and important bands in rock ‘n’ roll history, The New York Dolls. Red Ray in gauze, net and metallic brocade by Kaisik Wong, 1974. Girl’s tie-dye dress from 1970. The background is First Ceremonial Enclosure by Marian Clayden, 1971. Welfare, winner of Levi’s Denim Art Competion, 1975, by Billy Shire. Medical School Outfit by Barbara Ramsey, 1971. And who doesn’t love a good macrame planter? “Paisley” Coat for Sylvia Bennett by Janet Lipkin, 1970. Day and Night Skirt by Alexandra Jacopetti Hart, 1973; Necklace by Laurel Burch, 1971.